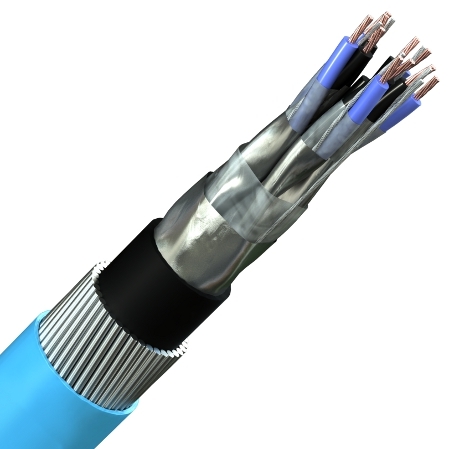 BS5308 Part 1 Type 2 Armoured PVC Instrumentation Cables incorporate a SWA style armor for use in aggressive process control and instrumentation applications where mechanical damage is a danger. Like the unarmored versions, they are available with collective aluminum tape 9CAT) screening or individual and collective aluminum tape (ICAT) screens. copper drain wire, PE bedding GSWA armor, RP-PVC sheath – black or blue. wire, units laid up, collective aluminum/polyester foil screen and 0.5mm² tinned copper drain wire, PE bedding, GSWA armor, RP-PVC sheath – black or blue. CAT: Cables up to 50 pair are color coded in accordance with BS 5308 part 1, appendix A. Two pair cables are twisted as a quad and colored black, blue, green, brown. ICAT: Each pair black, blue and numbered. 0.6/1kV versions can be manufactured to order. RP-PVC is a reduced propagation version of PVC producing no more than 15% HCl emissions if burnt. It is not Low Smoke Halogen Free. Capacitance figures are mutual @ 1kHz. Larger pair counts and triple configurations are available on request. Call as at 310-459-8430 or email us if you have any questions about Instrumentation Cable.